Heat a grill to medium heat. Brush mango and pineapple pieces with coconut oil. Place fruit onto the grill and cook for 2-3 minutes on each side. Transfer grilled fruit to a plate and drizzle with lime juice. Add the rest of the ingredients into a salad bowl and toss. Once fruit has cooled add in bowl with the salad and toss again. Dress with olive oil and extra lime juice to suit taste. 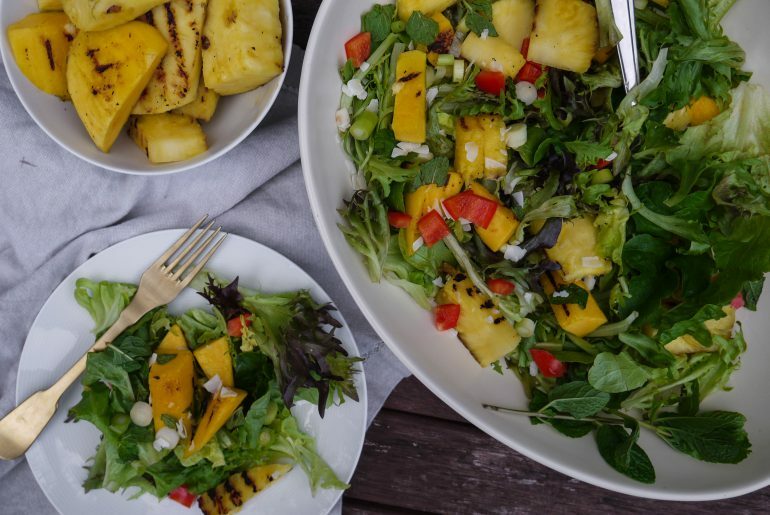 Mango and Pineapple are a dreamy combination and this salad takes them to another level by gently cooking pieces on a grill then mixing the fruit in with more tropical ingredients to make the ultimate Summer salad to accompany weekend BBQ feasts. We import pineapple and mangos to NZ, however don't let that put you off, you can still grow the fruit if you live in the warmer parts of the country. See here if you want to try your hand at this. Mango and Pineapple are rich in Vitamin C, fibre and antioxidants. Add to salads, mix in with yoghurt, fish or chicken dishes, cakes and other baked dishes. Make a passionfruit salsa with mango, tropical ice cream with mango and pineapple or pineapple salsa with lemon fish tacos thanks to 5+ A Day for the recipes!